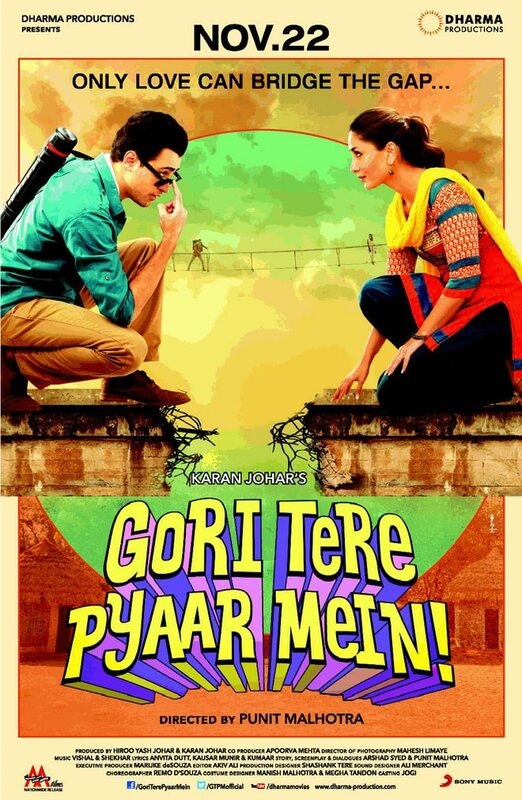 Punit Malhotra, of 'I Hate Love Stories' fame, has directed this Kareena Kapoor and Imran Khan starrer. In 2004 there was a scientist called Mohan who flies down to a small village in India to meet his grandmother Kaveri. The village stands in a poor state, in that it lacks the basic amenities like electricity, while the villagers continue to live in the dark. Literally. This is where Mohan comes in. Enter architect Sriram Venkat (Imran Khan) from America, who also lands up in a small village in India. His reason to land up here? His ex-love Dia (Kareena Kapoor) an NGO type, who's in this little viallge in Gujarat to help the poor and the helpless. Sriram feels the only way to win his love back is to build a bridge in the village, and to her heart. And as time moves on, he comes face to face with a corrupt collector. The story unravels in a constricted space. Not only did Kareena stick to a mere six costumes thoughout the film, the film's set too seemed small. Moving on, Dia is the kind of girl who wants to do something for the poor, while Sriram finds such talk to be fake. He, in fact, feels Dia need to 'chill' a little more in life. This is what eventually leads to a break up. Enter another beautiful girl who's set to marry Sriram. Turns out, this new girl is already in love with a Punjabi boy. Imran Khan's acting in the movie is enough to put an entire audience to sleep. Kareena did okay comparatively. But there's no one else really in a big role, to pit her acting skills against. Isha Gupta, did a fine job, and it seems she's here to stay in Bollywood. All in all, the story is weak. Direction is poor too. Had Puneet stuck to a different kind of film perhaps, one that catered more to generation Z's rich tastes, then that film would've definitely fared better. Vishal-Shekhar have composed the music in the film, and when heard otherwise, the songs seem nice. Watch the movie if you have to, if you like to watch big stars on the big screen. For the rest, skipping this movie would be a wise decision. Star cast: Sunny Deol, Prakash Raj, Amrita Rao, Johnny Lever, Urvashi Rautela. What’s Good: Sunny Deol and Prakash Raj give exceptionally interesting performances. What’s Bad: Tacky camera work, a drabby second half and an uninteresting romance angle are spoilers. Watch or Not? : Singh Saab The Great is perhaps one of recent times’ most novel masala films. Despite a multitude of grave hitches, the film is surprisingly original and intense. Being fed on a host of extremely trashy and mediocre masala films which have become Bollywood’s staple these days, Anil Sharma gives us a welcome change. Sunny Deol and Prakash Raj make the film worth a watch for their earnestness and ardour at portraying their respective roles. I won’t call this fantastic or thrilling but for its sheer unconventionality, the film had me impressed. Collector Karanjit Talwar (Sunny Deol) is known for his honesty in the political circles. His life comes to a standstill following a posting to Bhadori where the corrupt Bhudev Singh’s (Prakaj Raj) words is the law of the land. As Talwar tries to stop the area’s malpractices with his strict norms, the man faces the brunt of his good deeds as the villain victimized his family. It is not long before Talwar loses his dear ones and lands up in jail framed under charges of crimes he hasn’t even committed. But the determined man maintains his will power and mental strength emerging as a social worker under the name of Singh Saab and fights Bhudev’s intricate web of evil doings. The film retells how Singh Saab reforms Bhudev and takes a unique revenge on the guy. It isn’t a supremely brilliant script but something about the story ensures it has his heart in the right place. The film traces the story of Singh Saab, who was formerly the Collector of a small town in North India. Somehow his life sees a drastic shift when the man is posted in Bhadori. The topsy turvy change of events lands him in jail, which kicks of the vigorous chain of events. There is something about stereotypical Bollywood heroes, the notions of which are constantly shifting contours these days. Earlier they used to reek of idealism and were heavily moralistic. Interestingly, Singh Saab The Great reprises the same flavor of righteousness in the film and gets preachy without hitting the wrong note. It is the return of the desi hero on screen after a good long time. The villain is an overbearing evil spawn of a human being who destroys Karanjit Talwar’s life with a seething brutality. The film makes a comment of how the worst of evils can’t overshadow the kindness and goodness in the world. The last movie which came closest to this theme was Prakash Jha’s Satyagraha which lost plot despite being well intentioned. Anil Sharma, however, uses a more layman method to reach out a similar message to the public. Singh Saab The Great wasn’t a sermon as from time to time the director remembers to give its audiences judicious dozes of action and masala. I specifically like Sunny Deol’s Messiah Avatar. Despite spending years in the jail after being falsely framed, he turns to the good path with the same strength and potency. Singh Saab‘s story is largely simplistic which makes its an easy feed for every kind of audiences thus widening its reach. The story uses very stereotypical props which comprises of an idealistic collector and a slimy plotting villain. However, after watching a series of films which subtly glorify criminals this one is surely a respite. There are heavy hindrances in the plotline too. Sunny Deol’s romantic angle and chemistry with his wife is dull. What saves the simplistic story is the execution which is powerful and emphatic. Sunny Deol syncs himself in an all powerful and strong avatar. In the role of an intense and upright man, Deol fits perfectly with his gentle eyes that reflects goodness. I would take the cue to mention that the film has awfully believable stunts. When Sunny Deol thrashes someone with that intensity it sounds more plausible unlike a lanky looking hero beating goons to pulp. He is solemn is his role which becomes one of the film’s strongest highlight points. Urvashi Rautela is a misfit. Failing to bring out the chemistry with Sunny Deol, I did not feel very bad when her role was unceremoniously cut short in the film. Amrita Rao is good in parts. Though I did not like her in Satyagraha, I can safely say this film is an improvement to her last one in which she was absolutely wasted. Prakash Raj delivers a lip smackingly delicious evil performance. One of his best work since Singham, even with fewer clap traps, he manages to make you detest him. Johny Lever and Sanjay Mishra are utterly unused as clownish side kicks which could have easily been left out. Anil Sharma’s direction doesn’t get overtly heavy handed as it manages to leave by a good impact, though it is important to chide the director for making us bear through the statutory romantic track that acts as an initial catalyst in creating the skeletal framework of the story. It is a given that you’ll have to sit through the exhaustive chemistry of Urvashi and Sunny to deserve the combustible teaming of Prakash Raj and Sunny Deol. The film’s tacky camerawork and terrible music with songs called ‘Palang Tod’ can all be excused for its flavorsome nifty action scenes. The film’s over familiar story with the family angle and social welfare theme doesn’t quite wear you out due to its satisfactory ending. This isn’t Anil Sharma’s best work but it is watchable. Singh Saab The Great is far from an impeccable film. Rather it is an exclusively loud film but in an era where Bollywood is becoming unusually predictable, here is a story which shows a flair of rare novelty. For Sunny Deol and Prakash Raj’s pummeling duels, I found the film satiating for its potent message. It is way better than the ranks of awfully mediocre masala film we are compelled to watch week after week. Just because Anil Sharma has dared to try his hand at anything remotely fresh I am going with a 3/5 for this one. A strict not-to-missed for Sunny Deol fans who are sure to have an enjoyable time.